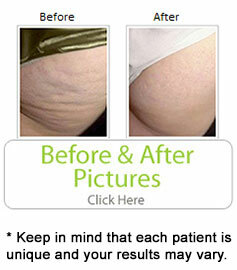 Velashape is the first and only FDA cleared technology approved to reduce and remove cellulite. It has also been proven to reduce up to 3 circumferential inches in treated areas. heated, Velashape combines the use of vacuum and massage to gently breakdown the cellulite allowing it to be re-absorbed into the body. It is recommended that individuals keep themselves very hydrated following each treatment to allow the toxins to filter out of the body naturally. For maximum results, Dr. Salomon recommends that patients schedule 6 to 8 Velashape sessions and have the treatment performed once per week. Sessions last approximately 45- 60 minutes and Velashape is completely non-invasive allowing patients to return to their normal routine following each treatment. Patients have reported mild discomfort caused from the heat produced by the radio frequency; this discomfort subsides once the session is complete. Some patients have also experience mild bruising, which will also subside within a few days. As with any other weight reduction therapy, it is important to maintain a well-balanced lifestyle in which proper nutrition and exercise are incorporated. Dr. Salomon recommends that all his patients exercise regularly to maintain the results generated by Velashape. Is Velashape Right for Me? Not all individuals are candidates for Velashape and it is important to discuss your concerns and expectations with your physician to ensure the most satisfactory outcome. Schedule your complimentary consultation with the team at Dr. Jhonny Salomon Plastic Surgery & Med Spa today to see if you’re the right candidate for Velashape.